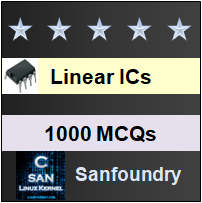 This set of Linear Integrated Circuit Multiple Choice Questions & Answers (MCQs) focuses on “IC Chip Size and Circuit Complexity”. 1. How many gates per chip are used in first generation Integrated Circuits? Explanation: The first generation ICs belongs to small scale integration, which consists of 3-30 gates per chip (approximately). 2. Find the chip area for a Medium Scale Integration IC? Explanation: The approximate length and breadth of Medium Scale Integration would be 4 mm. Therefore, its area is given as = length × breadth = 4mm × 4mm = 16mm2. Explanation: Very Large Scale Integration (VLSI) ICs are fabricated using more than 3000 gates/chip, which is equivalent to 20,000 – 1,00,00,00 transistors/chip. 4. What type of integration is chosen to fabricate Integrated Circuits like Counters, multiplexers and Adders? Explanation: Fabrication of ICs like counter, multiplexers and Adders requires 30-300 gates per chip. Therefore, Medium Scale Integration is best suitable. 5. Determine the chip area for Large Scale Integration ICs. Explanation: The chip area for a Large Scale Integration IC is 1 cm2. => Area of LSI = 10mm × 10mm = 1cm × 1 cm = 1cm2. Explanation: Ultra Large Scale Integration have nearly 106 – 107 transistors/chip. Hence, it is possible to fabricate smart sensors and special processor. Explanation: The concept of Integrated circuits was introduced by Texas instrument and Fairchild Semiconductor, whereas Bell telephone laboratories developed the concept of transistors. 8. Which process is used to produce small circuits of micron range on silicon wafer? Explanation: It is possible to fabricate as many as 10,000 transistors on a 1cmX1cm chip, using photolithography process. Explanation: All these techniques are used to produce device dimension as small as 2µm or even down to sub micron range (<1µm).